Not only do we have the gourmet grilled cheese-centric food truck Melted at the market on Sunday, we also have free Halloween cookies from Savory N' Sweet to any kid that shows up in a costume. What more could your little tyke want than a grilled cheese and a free cookie?! How about perfect weather? Sunday should be a gorgeous sunny fall day in the 60s. Come all decked out in costumes before the Del Ray Halloween Parade and get yourself set for a perfect day in the great out-of-doors! New Aussie vendor "For Keepsake" starts Sunday! Our newest vendor, For Keepsake, will be back this Sunday. Teresa and her husband have recently moved from Australia and are nicely settling into the ‘Del Ray’ way of life. 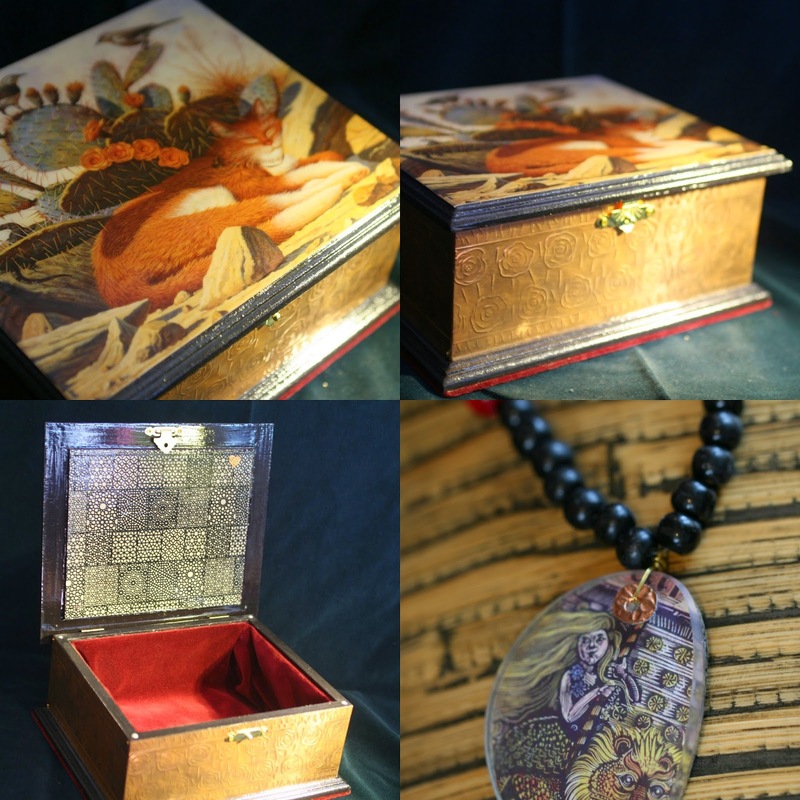 Teresa’s main craft product is hand-made ‘Keepsake Boxes’ which have been beautifully decorated with embossed sheet metal, decoupaged with interesting pictures from books, and lined with soft fabrics. The boxes make great gifts to keep those special photos, and keepsake items. Styles are suitable for children and adults. Teresa also makes a small amount of necklace jewelry using her signature ‘red bead'. They are fun, quirky and unique pieces. They are made from recycled eye-ware and each piece contains a red bead. Thanks for donating all this stuff!! Thank you to everyone that donated gently worn, clean, cold weather clothing and rain gear for St. Rita's Annual Clothing Drive! We were able to donate more than a dozen bags of clothing for the cause! The clothes were distributed on Saturday, October 25th from the St. Rita School Hall to our neighbors in Arlandria. 4MRMarket is donating $1,000 to 4MR Park tree planting efforts. Along with the $1,000 4MRMarket won from ActionAlexandria Green Ideas Challenge (funded by Dominion Power) and $1,000 from crowd funding through Citizinvestor, that's $3,000 for trees in 4MR Park and surrounding areas! Mike Elosh will be on stage from around 10am - noon this Sunday! Mike is a roots and folk musician that you've probably heard during his monthly performances at St. Elmo's Coffee Pub or during one of his many sets on 4MR Stage! 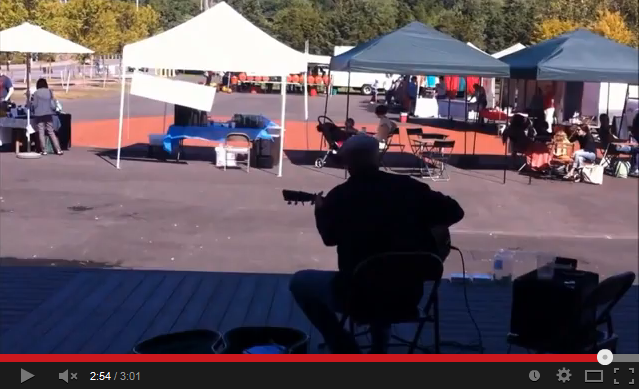 Mike provides the music from last year's tour of the 4MRMarket, so check it out to get a sampling of his works and a fun tour of the market! Remember, these musicians volunteer their time on Sunday mornings to make yours even brighter! They graciously accept tips and friendly applause, so please help support music at the market! Bring your (non-animal) food scraps to 4MRMarket in any type of container you choose, or purchase one on-site for a very low fee. 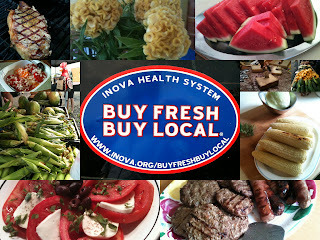 The Stifler Farm aka "What's For Dinner Now" - (Will be back in early November) Farm-raised Black Angus beef, humanely raised on lush pasture fields of the Shenandoah Valley, naturally farmed pork--plus Uncle Frank's Grilling Sauce!! Caffeine. - Serving freshly roasted pour-over coffee (hot OR cold) from various sources at their pour over brew bar! Also selling freshly roasted beans so you can enjoy the magic 7 days a week! Melted Food Truck (Alexandria) - Melted aims to bring gourmet grilled cheese sandwiches to the DC area. Whether at your office, on the street, or at your event, you'll find masterfully crafted artisan breads and high-quality cheeses, toppings, and sauces to keep you comfy and cozy all day long. In Cheese We Trust! Felicity's Handcrafted Soaps (Alexandria) - This specialty crafter of hand-made soaps and knitted items will be at the market every Sunday. For Keepsake (Del Ray) - Recent Australian transplant Teresa hand-makes beautifully decorated ‘Keepsake Boxes’, plus necklace jewelry made with recycled eye-wear and her signature ‘red bead’. Also, look for Dahn Yoga! FOLLOW. Keep up to date on all the goings on by following 4MRMarket on Facebook, Twitter, Google+ or via our website and blog.